At I Heart Brunch, we’ve been talking for years about a place that would serve brunch all the time, but had yet to see it happen. So you can imagine our excitement when we heard that Permanent Brunch finally opened to satiate our fix for brunch whenever we desired. Expecting long lines for weekend brunch, we decided to try Permanent Brunch for dinner last Friday evening. 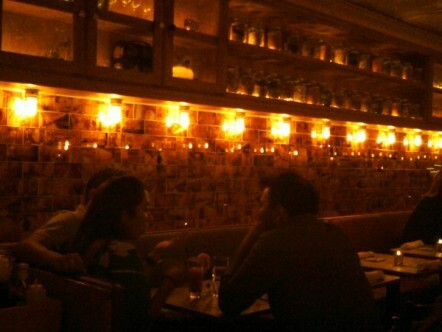 The place is quaint, with still life photographs of New York along the walls and high shelves holding mason jars filled with various spices, evoking the feel of a small bistro. For a place with 12 or so tables it initially appeared that they might be overstaffed, but they certainly know what they’re doing because the service was excellent. A couple of us started with a freshly prepared Bloody Mary, served in a highball glass with three olives and just the right amount of kick, while others opted for a cold draught. The server was even kind enough to bring us a taste of a couple of their red wines too, which would pair nicely with several of their heartier dishes. Despite the relatively limited number of choices, the decision on what to get was excruciatingly painful. 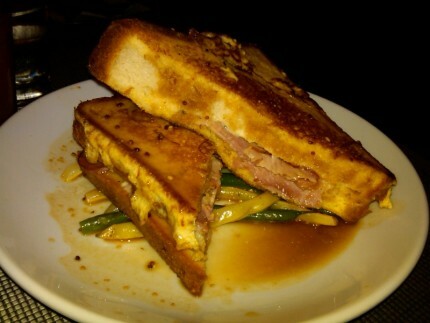 I eventually opted for the Ham and Cheese Stuffed French Toast, a savory delight that had the soft and chewey texture of french toast but the flavors of a croque-monsieur. The dijon-maple jus was a nice replacement for syrup, though I wish the maple flavor came through a bit more to balance the saltiness from the Vermont smoked ham and mustard. The Pan-Roasted Chicken & Waffle was a delicious mess, literally. 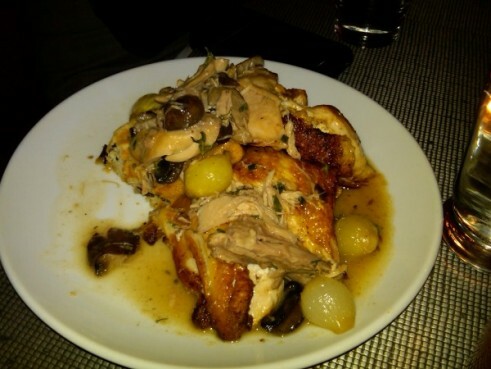 Though the plating left something to be desired, the chicken was perfectly cooked and bursting with flavor. The waffle was good and we wished there was more of it, although the bacon flavor didn’t shine through as much as we expected. 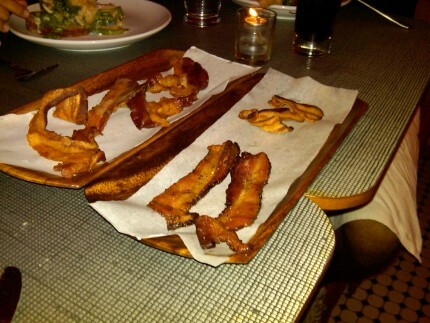 That’s ok, because we ordered plenty of bacon from the artisanal bacon menu to make up for it. The waitress helped navigate us through bacon overload since we were tempted to just get them all. We finally settled on the New Braunfel’s Peppered bacon, the Hungarian Smoked Kolozvari bacon and the Burger’s Sugar Cured Smokehouse Country bacon. All great choices, though I don’t think you can really ever go wrong with bacon. The peppered bacon was thick, meaty and peppery in contrast to the Hungarian Kolozvari, which was much thinner and had the smokiest flavor of all. The Burger’s sugar cured bacon was in the middle, serving up a hint of sweetness with traditional country bacon flavor and texture. All in all, Permanent Brunch conjures up images of brunch, while the food, flavors and atmosphere are all more sophisticated than you’d traditionally associate with brunch. I’m sure that was the intent of owner Lesly Bernard and Chef Meg Grace and so far they’ve succeeded. We’ll definitely be back for dinner.